The best wireless speaker ever? Everybody always forgets about France. When people think of high-end audio, they think of Germany and Austria (Beyerdynamic, AKG) Great Britain (Chord, Bowers & Wilkins) and Japan (Audio-Technica). They don’t think about the French. But Devialet are a perfect example of a company from that country making serious waves: their Phantom takes the very concept of a wireless speaker, and launches it into space. In this review, we break down the Gold Phantom’s sound, design, packaging and accessories, specs and more. To see how it stacks up, see our list of the best wireless and Bluetooth speakers. Before we begin, it’s worth noting that this is a slightly different review to what we normally do. When we contacted Devialet, the company didn’t have any review loaner models in stock – however, they said we were more than welcome to visit their store in New York City at any time, to test their Devialet Gold Phantom model. As it so happened, we were in New York for CanJam 2018 - a huge headphones festival – so, when we were done with that, we took ourselves to the company’s Soho store for a demo. Normally, this kind of arrangement isn’t something we like. We prefer to test speakers on our terms, over a long period of time, like any real-world listener might. In this case, however, we are going to give Devialet a pass, and not just because they gave us a very gracious one-on-one demo. While we might have listened to the Gold Phantom in their swanky testing room, which no doubt contain some flattering acoustics, we’re pretty sure we got the full measure of this particular wireless speaker. That’s because there’s no possible way to fake what we heard, which was some of the deepest, most unbelievable bass on the planet. You cannot believe – you really cannot believe – just how intense the low-end on a Gold Phantom is. This is, after all, a product that can put out 4,500 watts when it’s turned up to the maximum, and which uses woofers (bass drivers) that feel like they have more R&D behind them than tech Elon Musk is launching into orbit. The bass felt like it extended back into infinity, swamping the room with unbelievable vibration and power. We love subwoofers, but this was something else. This was an eighth of the size of an SVS PB16-Ultra subwoofer (full review here), which we consider to be the one of the best available right now, and it easily held its own. Very few experiences in the audio world leave our jaws on the floor. We hear a lot of gear that’s very good, even occasionally great, but we’re pretty experienced at this point and it’s hard to really knock our socks off. The Gold Phantom? That knocked off our socks, pants, underwear, flesh, skeleton, and immortal soul. The bass is that good. And Jesus Christ Buddha Yahweh Satan Vishnu Flying Spaghetti Monster, was it loud. Fortunately, the Gold Phantom doesn’t just have that one trick up its sleeve. While the high-end and the mids are nowhere near as impactful as that unbelievable bass, they still manage to impress. In fact, the other parts of the frequency spectrum were surprisingly subtle, spiked with detail that seemed to float on an ocean of wonderful bass. They aren’t really going to compete in with a pair of detailed floorstanding speakers, like the Bowers & Wilkins 700 Series (which are a little cheaper than the top-model Phantom, at $2,300 to the Gold Phantom’s $2,990), but they easily match up to other comparable wireless speakers. The overall audio quality was fantastic, with almost no downsides. We did say almost. If there’s one criticism that could be levelled at the Gold Phantom and its brethren, it’s that a single speaker operating on its own doesn’t have mind-blowing soundstage and spacing. It’s good enough – it certainly doesn’t take anything off the table – but it does occasionally become difficult to precisely place instruments in a particular song. Devialet, of course, have a rather convenient solution to this: just buy two. It’s not exactly the most cost-effective solution – and we will be talking at length about the cost of this particular speaker in a minute – but it absolutely does resolve the problem. Two of these things assaulting your eardrums at once, from two different directions, is the kind of thing that can cause religious conversions. It’s absolutely magical. If, by the way, you do want increased stereo spread and spacing from a single speaker, you might want to try something like the Naim Mu-So. It’s less than half the price of a single Gold Phantom - at around $1,299. It definitely doesn’t have as magnificent a low-end, but it manages to do a finer job of replicating the spacing in the music. You can’t talk about the design of the Phantom without talking about the things that cause that magnificent bass. Those would be the twin woofers, one on each side of the egg-shaped speaker. They’re powered by technology the company calls Heart Bass Implosion – it sounds cute until you see it in action, and hear it pounding your skull into a paste. The twin drivers actually move in and out as the music plays, visibly vibrating, which is almost hypnotic to watch (you can read more about the tech here - trust us, it’s worth a look). It lets the comparatively tiny speaker put out huge levels of power and volume, and it only works because the entire package is sealed under immense pressure. We asked the Devialet reps what would happen if the pressurised speaker were to be breached, and they diplomatically said they didn’t know, although they suspected there might be a bit of a bang. It would be very easy for Devialet to package all this technology in a very ordinary-looking speaker, but they didn’t. What they came up with – and we suspect it’s a shape that will endure long into the future for this particular product line – is a science fiction egg. No, you know what? Imagine a facehugger egg from the Alien movies, turned on its side, and you’ve got the general idea. It even looks vaguely alive, with the curved accents and the grille on the front end that resembles an eye. It’s a striking look, and combined with the wobbling bass drivers, it means that this isn’t a speaker you’re going to hide away. The only comparable design we can think of is that of the KEF EGG (full review here) which is a markedly inferior speaker in every way. It still fascinates us that this is a wireless speaker. It shouldn’t – standards in wireless speakers have been getting better and better – but it genuinely feels like it should be fully wired. The sound is that good. Still, wireless it is. You get both Wi-Fi connectivity, and aptX Bluetooth (there is negligible difference in audio quality when switching to the latter), and access to a full range of services. This includes Spotify, Soundcloud, Deezer, Tidal and many more - the speaker even comes with a free Tidal subscription. You can also connect via an ethernet cable, as well as optical. All of this is managed through the very capable Devialet Spark app (iOS and Android). While it isn’t quite as well-designed or as effective as the Sonos app, which remains the standard for this sort of thing, it still manages to be very good indeed. Categories are sensibly ordered, and navigating around the app feels smooth and intuitive. Although we didn’t test this particular feature, there’s also the ability to create collaborative playlists with your friends, which we imagine could be pretty good fun. And on that note, perhaps it’s time we did talk about the price. Because make no mistake: you will pay dearly for a Gold Phantom. That top model – the one under review here, the 4,500 watt monster - costs a smoking $2,990. Even if you buy the slightly less powerful models, you’ll still be parting with four figures. The Silver Phantom (3,000 watt peak) goes for $600 less, at $2,390. The 1,200 watt base model runs a little cheaper, at $1,690. Outside of those wattage figures, there are huge differences between the models; they have the same construction and internals, although you will get more sound pressure level the more you pay. This, then, is perhaps the biggest problem with the entire Devialet line. It’s unquestionably one of the best Bluetooth and wireless speakers ever made, perhaps the best. But it’s priced for audiophiles – people who haven’t, historically, been that keen on wireless speakers. If anybody can change that particular viewpoint, it’s Devialet. We have no doubt about that. But it does mean that buying even one of these speakers can be a major decision. If you do want a speaker that offers a little bit more value for money, then you could try either the aforementioned Naim Mu-So, or something like a MartinLogan Crescendo. You definitely won’t get the same quality, but they are significantly cheaper – the Crescendo retails for $439, compared to even the base Phantom’s $1,690. The Gold Phantom has aged a little since we first wrote this review. Devialet have released an even more attractive option: the comparatively affordable Devialet Phantom Reactor. It’s smaller, less powerful, and doesn’t have bass that goes quite as deep. Is that a bad thing? No way. The Gold Phantom is superb, but it’s overkill (in the best possible way, of course). The Phantom Reactor is a nod to those who can’t actually justify buying a $3,000 beast. It delivers 900 watts, versus 4,500 for the Gold Phantom, and has a lower sensitivity of 98dB. But honestly? It still sounds fantastic. And it should be clear who it’s aimed at! Note that the Reactor is the first in a new product line from Devialet; all previous models, including the Gold Phantom, are now folded into the Phantom Premier line. We know - it’s confusing for us too. Pop off the seals on the beautifully-designed box the Gold Phantom comes in, and you’ll find that it opens up into two distinct halves. Nestled in the middle is the speaker itself, cocooned in white fabric, resting on a special plinth. While there’s nothing particularly special about this packaging, it does suit the overall egg aesthetic: you really do feel like you’ve extracted a living thing. Beyond that, you actually get very few accessories with the speaker. A power cable, and that’s your lot. There are several accessories you can buy, including an excellent remote, and various flavors of stand, but you will have to pay extra for these. While this shouldn’t be a problem if you’re willing to spend four figures on a single speaker, it does strike us as a little bit cheeky. The Devialet Gold Phantom has the best bass of any wireless speaker, ever. That is a fact. The overall sound quality is excellent, especially given what you pay. The design is just incredible, and the level of technology will put a smile on anyone’s face. You get a very generous 45 day home trial, as well as free Tidal subscription. The soundstage of a single speaker could be a little bit better. The Devialet Gold Phantom is, shall we say, a touch expensive. You will need to pay extra for any additional accessories, including stands or remote – although there are packages available on Amazon. *Power = All figures given as RMS power. The Devialet range is so singular, so very much in a class of its own, that it’s actually difficult to find truly comparable alternatives. Nevertheless, there are plenty of high-end wireless speakers available, and the most direct competitor is probably one we’ve mentioned already: the Naim Mu-So. It actually looks terrific, if not quite as eye-catching as the Phantom, and delivers some truly remarkable sound. It’s also far more affordable: at $1,299, it’s less than half the price of the top-range Phantom. If you want to go even cheaper, you can buy a smaller version, the Mu-So QB, for $799. We recently got a chance to test out the Totem KIN Play, a pair of wireless stereo speakers that are just stupendous. Totem are a Canadian company, based in Montréal, and the KIN Play represented new direction for them. The bass certainly isn’t as deep as that of the Devialet Speaker, but the KIN Play deliver superb stereo image and ridiculous detail, as well as some serious volume. They are surprisingly affordable, too, at $1,250 for the pair. 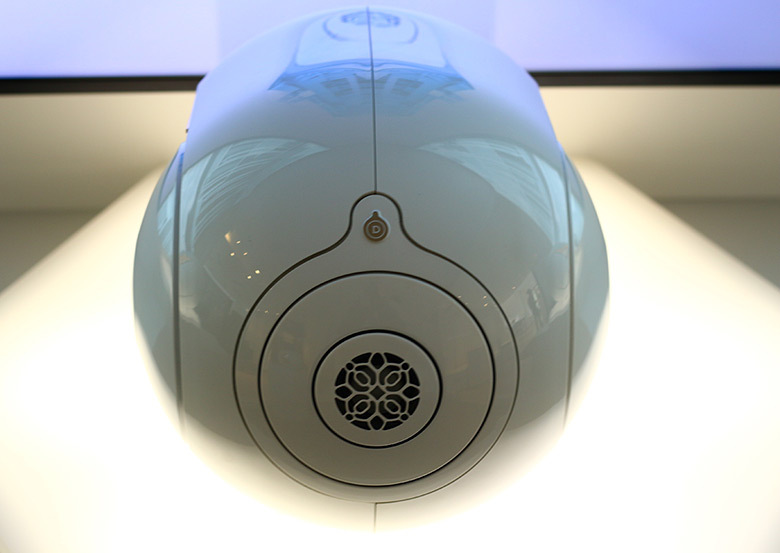 We’ve already mentioned the Devialet Phantom Reactor, but it’s worth revisiting it. On the one hand, it’s a less powerful version of the mothership, something that can only dream of getting that deep into the bass. On the other, it’s an entirely sensible choice. One of the biggest reasons for not buying the Gold Phantom is that the amount of money you’ll pay for it is quite frankly absurd, even now. As much as we love it, we fully admit that. So the Phantom Reactor makes total sense to us. It’s only budget in the sense that it’s cheaper than the original, but it’s still an absolutely fantastic alternative, and worth considering if you want a speaker from Devialet but don’t want to remortgage your house. And really, that’s what it comes down to. The sound. If audio quality was the only thing we evaluated, then the Gold Phantom – and probably, if we’re being honest, the entire Phantom line – beats every single other wireless speaker on the planet. We can’t quite go that far – the pricing, for one thing, means that this is definitely not the first option for most people. But it will always hold a very special place in our hearts, and we can absolutely confirm that it was worth travelling to New York City for.